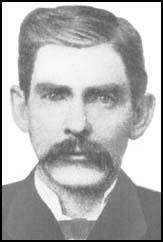 John (Doc) Holliday was born in Griffin, Georgia, on 14th August, 1851. His mother died of tuberculosis and Holliday also suffered from the disease for most of his life. After studying at dental school Holliday worked as a dentist at Atlanta. He then moved to Dallas where he attempted to make a living as a professional gambler. He also developed a drink problem and a reputation for a short temper. Accused of shooting several men, including the killing of a soldier, Holliday moved to Denver. In 1878 he arrived in Dodge City where he became a close friend of Wyatt Earp. Holliday worked as a dentist before moving on to Las Vagas. In 1879 he killed Mike Gordon but was not charged with murder. Later that year he was accused of robbing the Santa Fe-Las Vegas stagecoach. In 1880 Holliday moved to Tombstone where he once again met up with Wyatt Earp. Holliday was soon in trouble and Sheriff John Behan arrested him on suspicion of killing a stage driver during an attempted hold-up outside of town. Holliday protested his innocence and was eventually released. In September 1881, Virgil Earp retaliated by arresting one of Behan's deputies, Frank Stilwell, for holding up a stagecoach. Virgil Earp now decided to disarm Billy Clanton and Frank McLaury and recruited Wyatt Earp, Morgan Earp, James Earp and Doc Holliday to help him in this dangerous task. Behan was in town and when he heard what was happening he raced to Fremont Street and urged Billy Clanton and Frank McLaury to hand over their guns to him. They replied: "Not unless you first disarm the Earps". John Behan now headed towards the advancing group of men. He pleaded for Virgil Earp not to get involved in a shoot-out but he was brushed aside as the four men carried on walking towards the OK Corral. Virgil Earp said: "I want your guns". Billy Clanton responded by firing at Wyatt Earp. He missed and Morgan Earp successfully fired two bullets at Billy Clanton and he fell back against a wall. Meanwhile Wyatt Earp fired at Frank McLaury. The bullet hit him in the stomach and he fell to the ground. Behan arrested Virgil Earp, Wyatt Earp, Morgan Earp and Doc Holliday for murder of Billy Clanton, Tom McLaury and Frank McLaury. However, after a 30 day trial Judge Wells Spicer, who was related to the Earps, decided that the defendants had been justified in their actions. Morgan Earp was killed when he was playing billiards with Wyatt Earp on 18th March, 1882. Eyewitnesses claimed that Frank Stilwell was seen running from the scene of the crime. Three days later Stilwell's was found dead. A Mexican who was also implicated in the crime was also found murdered in a lumber camp. It is believed that Wyatt Earp and Doc Holliday were responsible for the killing of both men. In February, 1883, Luke Short moved to Dodge City and purchased the Long Branch Saloon with W. H. Harris. A power struggle now took place between Short and Nicholas B. Klaine, the editor of the Dodge City Times. In the election for mayor of the city later that year Klaine supported Larry Deger against Short's partner, W. H. Harris. Deger defeated Harris 214 to 143. Short had some powerful friends and in June 1883 he returned to Dodge City with Holliday, Wyatt Earp, Bat Masterson and Charlie Bassett and other well-known gunfighters such as, M. F. McLain, Neil Brown and W. F. Petillion. However, Deger and Klaine refused to be intimidated and when they refused to back down, Short and his friends had to accept defeat. In November 1883, Short and Harris sold the Long Branch Saloon and moved to Fort Worth. Doc Holliday died of tuberculosis on 8th November, 1887.